DURHAM, N.C. (WTVD) -- The family of Charleston Goodman wants to set the record straight about some of the information coming out about their son's kidnapping and presumed killing. Nearly a year after his abduction, he is still missing. They also want answers from those responsible. "I'm not too proud to beg. So I'm begging you in the name of Jesus. Tell where my child is," Tammie Goodman, Charleston's mother said. This is the one gift Tammie and Charlie Goodman Sr. want this Christmas. Outside their apartment on January 28, 2018, their son Charleston was walking toward his BMW when he was kidnapped and thrown into a mini-van. Tammie witnessed the attack and getaway. "I was trying to pull him out by his legs because he had kicked the door open on the van." "What happened to him? Where he at? How bad it is? I won't allow my mind to go there because it rips me up," Mr. Goodman Sr., stated. Eleven months later, two men are in custody as persons of interest in the kidnapping-turned homicide investigation. Jamaal Lowery and Marquaseo Andrews, who are suspected of being tied to a crip gang, may have information on what went down that evening, according to police. Warrants suggest the kidnapping may have been in retaliation, and that his body may have been fed to hogs. A source listed in the warrant says Charleston allegedly stole two bricks of cocaine from a person associated with Andrews. "My son was not involved in that breaking in to his house. Like I said I have the proof," Mrs. Goodman stated. "I know where my child was that night." Mrs. Goodman says her son was not a drug dealer. "If my son was a drug dealer my car wouldn't be about to be repossessed. I would be able to afford food, my doctor's appointments, I wouldn't be in the position that I'm in right now. Because my son wouldn't have allowed me to be that way." Durham Police say the case remains active but there are no new developments. 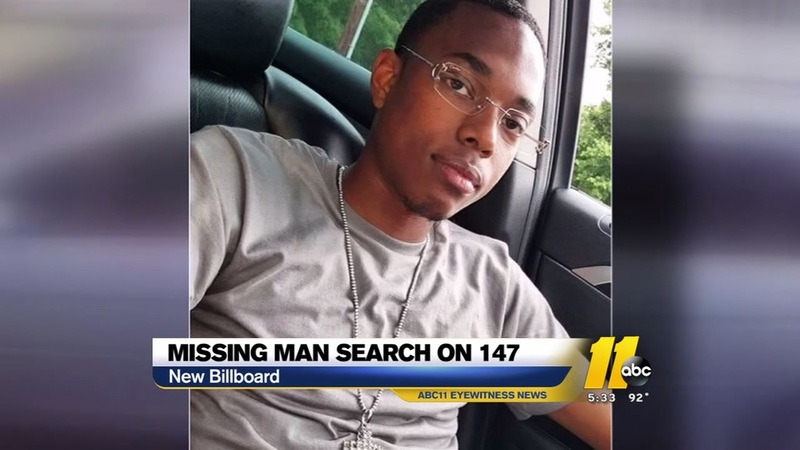 The family of a man kidnapped in Durham hopes a billboard will create new leads in his disappearance. The Goodman family and Charleston's daughter are now preparing to spend their first Christmas without him. "How do you explain that to a 6-year-old child?" Mrs. Goodman said. "I just want my child and it's not right. It's not fair that it's been this long." Andrews and Lowery are suspects in another homicide case.